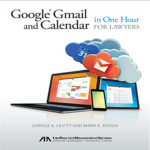 Google Gmail and Calendar in One Hour for Lawyers is designed as a step-by-step guide for lawyers to learn what features and functions are available in the Business versions of Gmail and Google Calendar, as well as related services such as Google Chat, Google Talk, Google Hangout and Call Phone. Millions of corporations, small businesses, solo lawyers, large and small law firms, and government agencies have moved from hosting their own e-mail servers ‑ and in some cases, calendars and documents ‑ to using Google Apps for Business. Understand security, confidentiality and ethics concerns related to Google Apps. The book includes anecdotes from lawyers and law firm IT professionals explaining how they use Google Apps for Business at their firms and the value and increased productivity they have derived from the products. Availability: TThis book is currently available and ordinarily ships within 1-2 business days.